Jam-Filled Oatmeal Suares are a popular homemade snack at our house. If you have kids like I do why buy granola bars when you can make them yourself? I don’t know about the rest of you but it seems that foods we eat everyday just experienced another spike in grocery prices at the supermarket. Every week something goes up in price and we have to adjust our budget accordingly. Okay it may only be cents but every penny does count especially if you are on a tight grocery budget. The products that I found which escalated in price were granola bars. My kids love granola bars but not so much my purse strings. What is granola? Good question because all granola really consists of is rolled oats, nuts, honey, dried fruits and brown sugar. Granola is most often used for snacks or cereal. I tend not to buy granola bars unless I have coupons as it’s classed as a luxury food in this house. The reason is because I can make granola bars myself although they are moist as the Jam-filled Oatmeal Squares have a layer of fruit in the middle. The oatmeal squares essentially resemble an oatmeal bar that is full of healthy goodness that you can make at home for a fraction of the price. 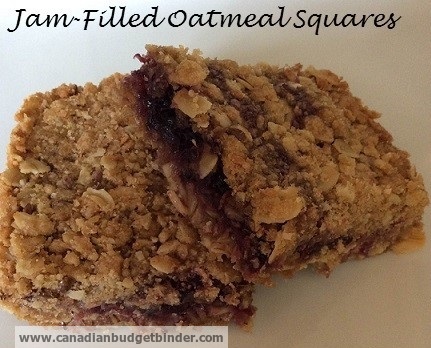 I fill the inside of my oatmeal squares with yummy homemade jam flavours that I know my kids enjoy. The best part of this Oatmeal Jam Squares recipe is that it’s done in one bowl so no big messes to clean up and they are ready in a jiffy. Some other popular oatmeal squares that you might enjoy are peanut butter squares, lemon squares, date squares, blueberry squares etc. but to be honest squares recipes are pretty versatile so you can add just about any flavour. I like recipes where I can switch up the taste but the base of the recipe stays the same. If I can make Jam-Filled Oatmeal Squares myself and put the dollars back into something else in our family budget I will. Recently as some of you are aware my husband got his work visa denied and was off work for three months until it got reinstated. That was the scariest three months ever for my family as the money was tight. We budgeted everything and I did everything that I could to save money including home baking, homemade meals, fresh-baked bread, buns and snacks. You name it I did it. It may not have come out good every time but mostly everybody enjoyed it especially the snacks. So today I bring to you the most easiest Jam-filled Oatmeal Squares ever which you can pack in your kids lunch for school or to have as an after school snack or to munch on any time of day. These Jam-Filled Oatmeal Squares are far better than the supermarket kind which I assure you has no crazy filler ingredients added. Jam-filled oatmeal squares are a delicious, healthy alternative to the store-bought granola bars and very simple to make in one bowl. Blend flour, oatmeal, sugar, salt and butter well. Spread half the mixture into a greased 9x9 baking dish and press down using the back of a tablespoon. Add one tablespoon of cornstarch to jam and mix well. This will ensure that the jam stays between the mixture. Sprinkle remaining mixture on top of jam and lightly pat down. Bake in the oven for 25-30mins or until they are light tan in colour. Before cooling cut into bars, they will firm as they cool. So if you are looking for some easy squares to make get the kitchen prepped for these Jam-Filled Oatmeal Squares and I promise you that you won’t be buying granola bars ever again. Thanks guys! It really is an easy and frugal recipe and the kids love putting in the jam especially if they helped make it lol! Can’t wait for fresh strawberries to make more jam. These look great! I will have to try! I think I will try gluten free flour and sugar free jam and see what happens!! Thanks for sharing your recipe! Let us know how that turns out for you Pat. Oh!!!!!!! I can see these disappearing very fast here!!!! My grandson will love them too!!!!! I’m looking after him the next two Saturdays, I wonder if my daughter has the makings at her place for these or if I have to bring my own to make some at her place…. She’s always looking for goodies for his school lunches too, can’t have any garbage in there either as they want the kids bringing healthy foods to eat. If anything comes in packaging it has to be removed before it gets to the school. Thanks for this yummy recipe Nicola!!!! !